Inverawe Smokehouses ensure their salmon are sea reared from small, independent farms, where best practice husbandry and low density stocking levels are paramount. Only by starting with the healthiest, fittest fish can you expect an extraordinarily good fish. Inverawe Smokehouse is different, in that it follows an age-old, traditional way of smoking. This time-honoured method allows the fish to gently take up the gorgeous smokey aroma in its own unhurried time, giving the most delicious full-bodied oak-smoked flavour that is so distinctive of Inverawe. We select only the smaller, leaner fish in their prime which are less fatty and give an excellent texture when smoked. 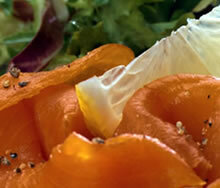 Succulent, full of flavour, with the perfect balance of oak-smoke, it is everything smoked salmon should be. The unsliced prime cut of the salmon gives the perfect gourmet experience. Cured, then gently smoked and roasted, in dense oak-smoke. This delicious smoked fish is one of our most popular. Endlessly versatile it is a super retail and catering item. This is the founder product of the Inverawe Smokery range. Similar in appearance to smoked salmon but with a lovely subtle flavour and a wonderful natural deep colour. Roasted closer to the fires these smoked trout portions are a real 'must have'. Dusted with cracked black pepper or plain these new cutlets are succulent and full of smoky flavour. A great NEW twist to an old favourite. The extra smoky trimmings are the outside slices of the smoked salmon and burst with smoky flavour. Ideal for pâtés, pastas and soups.